We are invited to attune our “antennas” to receive transforming energies from the Universe! According to the Mayan calendar Tzolkin, 19th July 2016 is a day with the Solar Seal “Yellow Human” and with Tone 4. This is Kin 212 in Tzolkin. This is the 4th day of the Central Green Castle of Enchantment. The yellow Solar Seal on the 4th day of each castle defines the major energy of the castle. So the Yellow Human is the major energy of the Central Green Castle. Besides, 19th July 2016 is a day of the White Planetary Wizard Year, which continues until 25th July 2016. 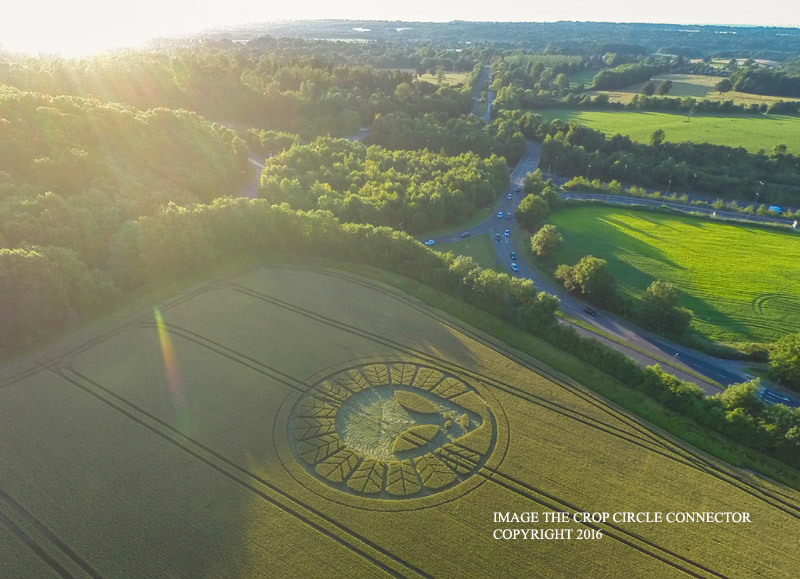 In my opinion, on the crop circle are depicted the main energies of the White Planetary Wizard Year and the main energies of the Central Green Castle of Enchantment. Red Moon, White Wind, Blue Eagle and Yellow Star – these are the major energies of the 4 wavespells in this castle. In the center of the formation we see the face of a human. On this way is depicted the energy YELLOW HUMAN. The human has enormous big eyes. On this way is depicted the energy BLUE EAGLE – the energy of VISION. There are 2 eyes. Here the number 2 symbolizes the energy WHITE WIND – Solar Seal No. 2. Below the 2 eyes there are 2 nostrils and 1 mouth. These are 5 figures in total. Here the number 5 symbolizes the energy RED SERPENT – Solar Seal No. 5. Around the face of the human there are 14 figures, which resemble ears of wheat. Here the number 14 symbolizes the energy WHITE WIZARD – Solar Seal No. 14. In each ear there are 6 small inclined dashes and 1 middle long dash. These are 7 dashes in total. Here the number 7 symbolizes the energy BLUE HAND - Solar Seal No. 7. The middle long dash is divided in 3 parts. When we add the 6 inclined dashes, we get 9 dashes in one ear. Here the number 9 symbolizes the energy RED MOON – Solar Seal No. 9. The ear of wheat is divided through these dashes in 8 fields: there are 4 fields on each side of the middle long line. Here the number 4 symbolizes the energy YELLOW SEED – Solar Seal No. 4. The number 8 symbolizes the energy YELLOW STAR – Solar Seal No. 8. The second last ear below on the right has at the right end one additional dash, so in this ear there are 10 fields. Here the number 10 symbolizes Tone 10 - the Tone of the White Planetary Wizard Year. Here the number 114 symbolizes Kin 114. Кin 114 in Tzolkin is WHITE PLANETARY WIZARD – the major energy of the current year !! The energy Yellow Human is a Yellow energy of Ripening. This energy helps us for our Ripening, for our spiritual Maturation. This is depicted symbolically through the ears of wheat, where there are Yellow Seeds. Each Seed has the form of a diamond shaped crystal. During the Ripening our cells, which have been transformed in crystalline cells, are now filled with light - this is the last phase of the process of Enlightenment. In these Yellow Seeds is recorded the information about our activities in this Tzolkin Module. At the end of this Tzolkin Module the Seeds with this information are planted in the next Tzolkin Module. With each new Tzolkin Module we begin our development from a new Yellow Seed and at the end of the Tzolkin Module we grow to a mature Yellow Human. 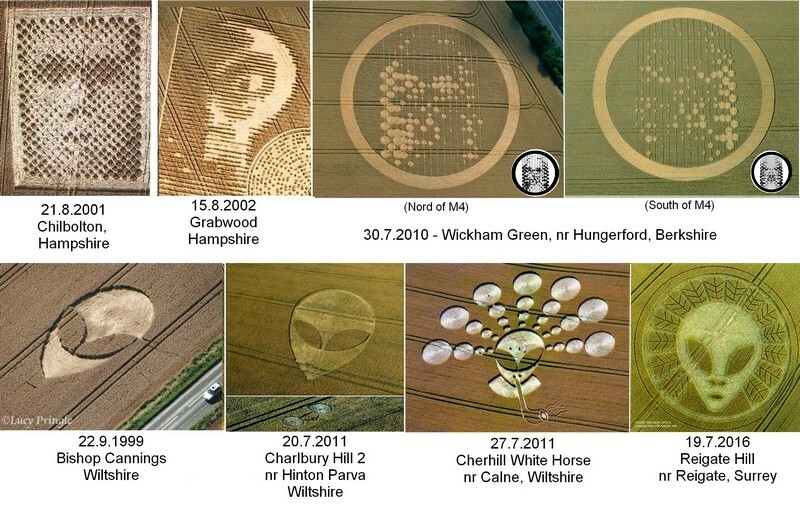 Heartfelt thanks to the authors of this amazing crop circle!! I find this very symbolic. We have to consider that reincarnation is something real. So where did "they" go and when and why will they appear again? There is definitely a deeper meaning in everything - no crime is forgotten nor is possible that it can pay off in the end. Legend has it that the Aztec deity Quetzalcoatl was a creator deity and essentially contributed to the creation of mankind. He broke through the boundaries between heaven and earth. Sometimes, he was also the symbol of death and resurrection. Quetzalcoatl is the feathered serpent, but was represented by different animals. From this perspective, it is not surprising that Quetzalcoatl as deity of creation, renewal and death and resurrection is depicted as a “feathered alien”, because it is likely that aliens are responsible for this kind of processes. Quetzalcoatl is also associated with Venus as a morning star. Around March 28, 2017, Venus will rise heliacal and become visible as a morning star. 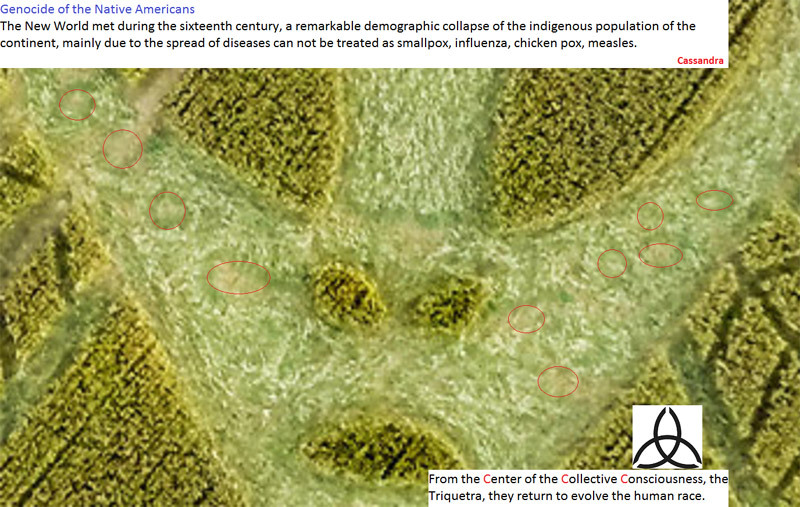 The crop circle formation shows 14 feathers. As March 28, 2017 will fall 18 × 14 days after the day of the formation (also 14 × 2 Aztec “weeks” of 9 days), this fits. 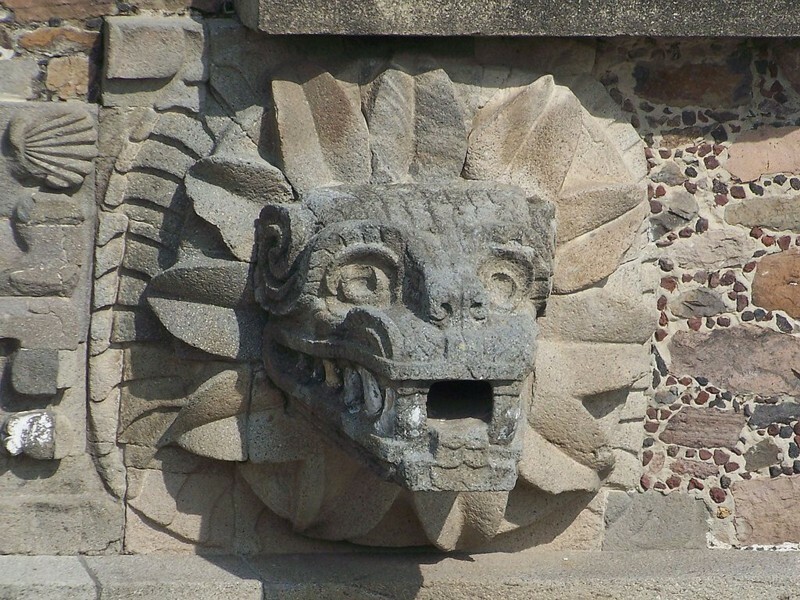 Quetzalcoatl is Kukulkan in Mayan mythology. Painting "Faces" in the past appeared several times. It is therefore necessary to take this into account. We are not alone in the universe. The crop circle illustrates the inner workings of a “Gravity Warp Engine”. 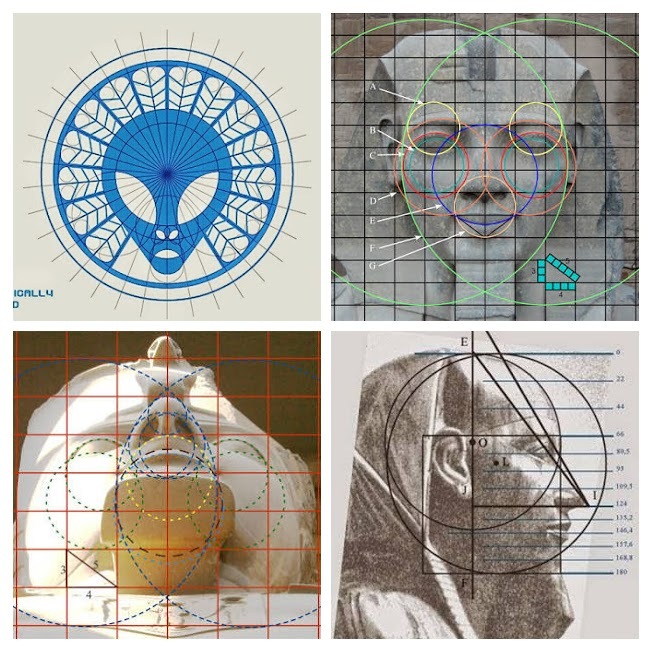 The three pyramids illustrate the three gravity wave guides in the lower deck. These can individually be adjusted, depending upon the configuration of movement. The center describes the anti-matter reactor. 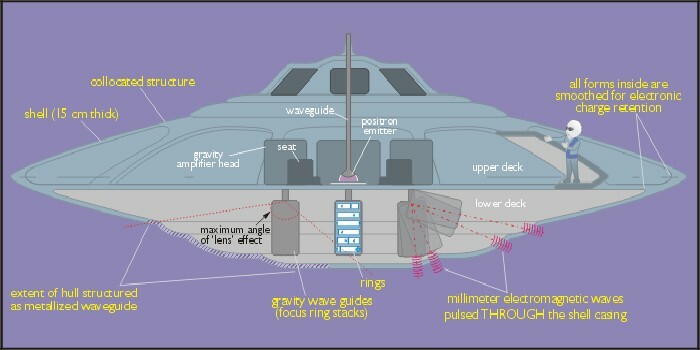 The arrows indicate how the gravity pulse rises along the vertical wave guide to the top of the craft in a “delta” configuration mode and encapsulates the ship in three outer points after the pulse is amplified by the amplifier. The details are given by the links below and I encourage the interested to go through the links below and study the contents. When I first watched the Bob Lazar’s video, I did not pay much attention to its content and dismissed, immediately. However, I read accidentally about the element 115, recently and am surprised that the Ununpentium was discovered in 2003 and accepted in 2004. The question then arises: How could Bob Lazar talk about a chemical element in late 80’s, which was found in 2003? 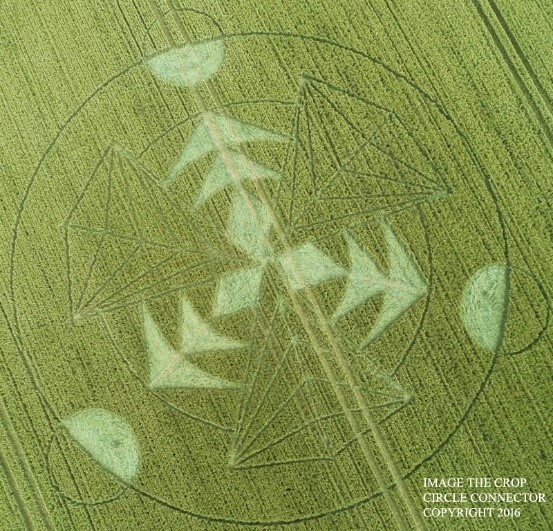 I haven’t got a mirrored image to share with you this time so instead I’m sharing a message with you that was found regarding this formation of this “Alien Grey” Crop Formation. I copied both the date from the Crop Circle web site of when the formation was found and also where the formation was placed and I found this warning within it. On Tuesday the nineteenth of July two thousand and sixteen at Reigate Hill near Reigate Surrey. Jesus to return at gate in the Holy Land. Can I just ask if anyone out there understood the symbolic meaning of that mirrored image that I placed on the comments page of the “Barrows Green, Nr Widnes, Lancashire” formation? 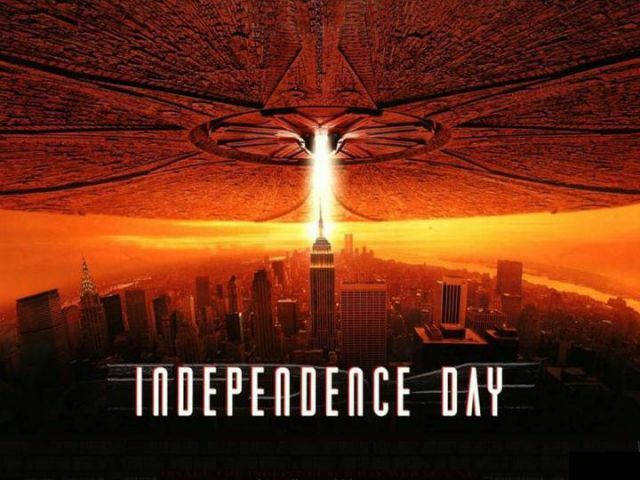 This formation was reported on the 7th of July? If you did understand the meaning of it could you share it with us please? 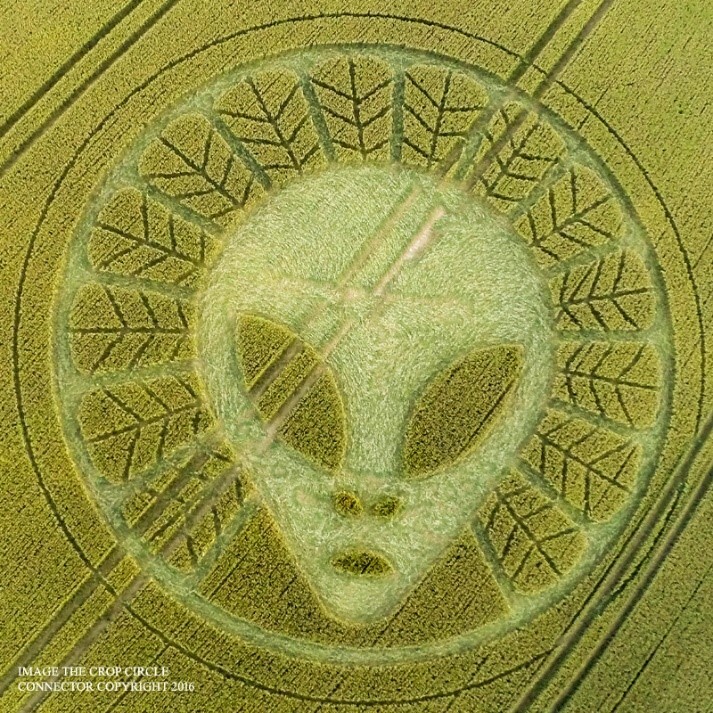 This crop circle has been filmed with a drone: www.youtube.com A big head of a Grey extraterrestrial being has been drawn in the field by some members of the very dangerous pro-Jesus and pro-Apocalypse invaders. I give the alert about they since 2008 ! There are 14 feathers round the head ! Why ? I remember a very known photography of an old Christian picture. I have found a photo of this strange image in the blog of Michel Théron at this page with the title extraterrestrials: extraterrestrial Mr Théron has written an extract of this: john-1428-father-greater "the Father is greater than I" (Jesus) [please compare the words feather/Father] and he has written at the end of his article: "(...) why an alien Jesus wouldn't exist ?" 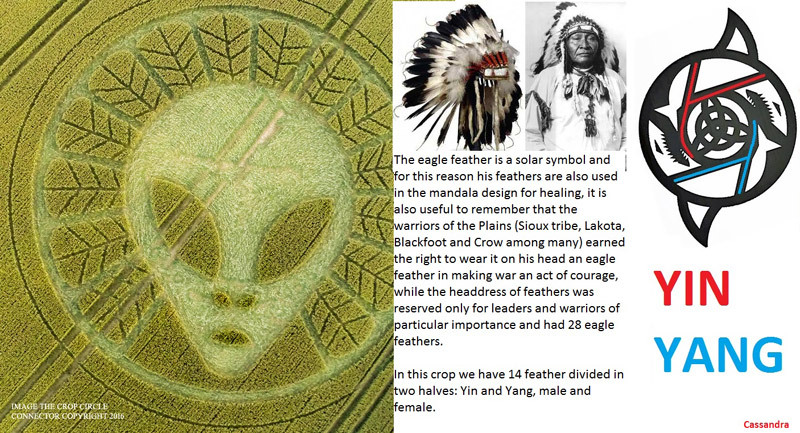 The feathers round the head in the crop circle symbolises the aureola of the Holy spirit of God in the alien Grey ! Hum ! The Grey beings of the pro-Jesus group have a chief whose soul is the same as Jesus, but I know that they try to deceive the humanity and that Jesus has betrayed the Source (God), the Mother or Mother-Father of the Universe (She is not the Father). For example Jesus entered in a Temple with a very bad spirit : El_Greco_13.jpg A terrible sign of this danger today with the pro-Jesus aliens : one of the attackers at the church saint-Etienne-du-Rouvray in France, 26th July 2016, seven days after the crop circle at Reigate has been reported, was Abdel Malik Petitjean. Jean in French is John, like the author of the Apocalypse in the Christian bible ! The invaders pro-Jesus are trying to dominate the Earth and the humanity with a new theocracy with Jesus omega as a mondial chief ! I am convinced that the dangerous ET pro-Jesus invaders will try to take advantage of this Rio 2016 Olypic games with UFO apparitions ! There is a message of the Earth on this photography. The rainbow is a sign of the ET pro-Jesus menace (bow) ! Le letter X for Christ is drawn inside. On the website of Chaldon, there is a photography of a sign with the name st Peter and st Paul church of England infant school. On this sign is a coat of arms with two keys crossed like an X. But there is a sword too ! Bible, Matthew 19:18: "You shall not murder". The ET Jesus omega is more dangerous as Jesus ! 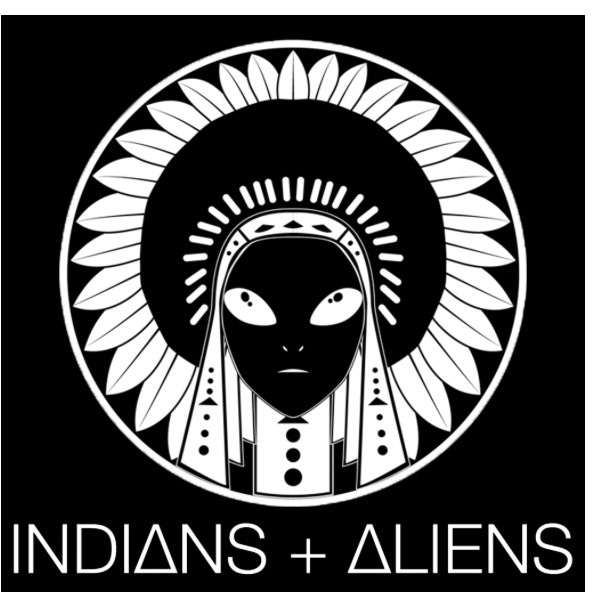 This is a Canadian show that has the alien with feathers as a logo.